Opener Shaw flayed the Caribbean attack during his 52-ball-70 on the second day of the second Test to give India a flying start. 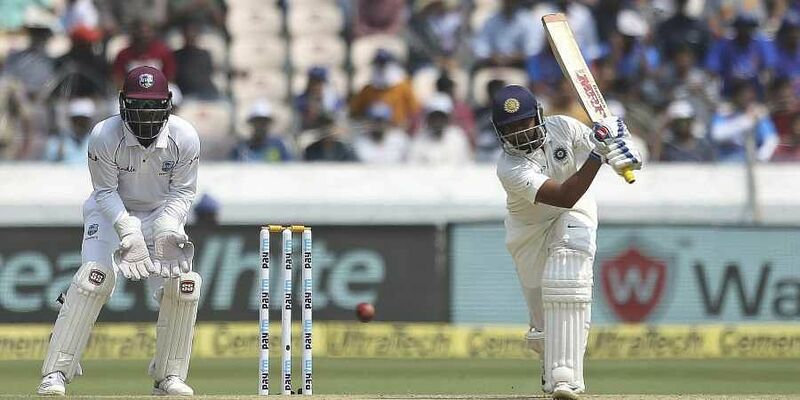 HYDERABAD: Young Prithvi Shaw's attacking style of batsmanship is allowing the senior Indian players to bat freely and without pressure, reckons West Indies all-rounder Roston Chase. Asked about the impact of his style, Chase said, "I think they look up to him to give them that good start and the other guys, more mature guys, just come in and knock it around and look to take ones and twos." "I just think that was their strategy, to really go hard with the young guy because that is his natural game, and make it easier for the other guys coming in after him. We tried to contain the batsmen. We set more defensive fields and tried to put more pressure back on them after they got the quick start and it paid off for us. But then, we had a few lapses in the field and that really cost it," said the in-form West Indian. Prior to the start of the match, Chase had said that they have a plan for Shaw having worked on their mistakes from Rajkot but admitted that they failed in execution. "As I said before, cricket is played on the field. Even though you might have plans, it might not always work, so we have to go back to the drawing board with those plans again." He was happy to get to a personal milestone as he struck his maiden century abroad. "After the first game, I really looked at my batting in both the innings and as I said, I thought that I was trying to over-hit the ball and on these quick outfields, that's not really called for. You just need to stroke the ball into the gaps and get the ones and twos and put the bad balls away and runs will come that way. "I really thought about that after the first game and I was pleased with my performance. I wanted to go bigger, it's never enough runs for the batsman. Umesh got the better of me today but I am still pleased with the century. It is my first century away from home, so it is a special one for me," said Chase, who now has two Test hundreds against India. He was sympathetic for reserve keeper Jahmar Hamilton, who had a tough day replacing an injured Shane Dowrich. "Not being in the game, being on the sidelines, just bringing drinks, he was not really accustomed to the pace of the game. So being rushed to come out there, I guess he wasn't really prepared mentally. It just probably gave him a quick jump. "He was keeping in an international game for the first time as well, so probably little nerves but I know Jahmar, he is a good keeper. I have played a lot of cricket with him in youth cricket, regional cricket. I know he will pick up the slack and turn it his way."